You probably recall the time when you were in Hawaii or some such and got that crunchy sand like ice in a paper cone doused in neon colored fruit juices. Am I right? WRONG! That’s shaved ice my friend. 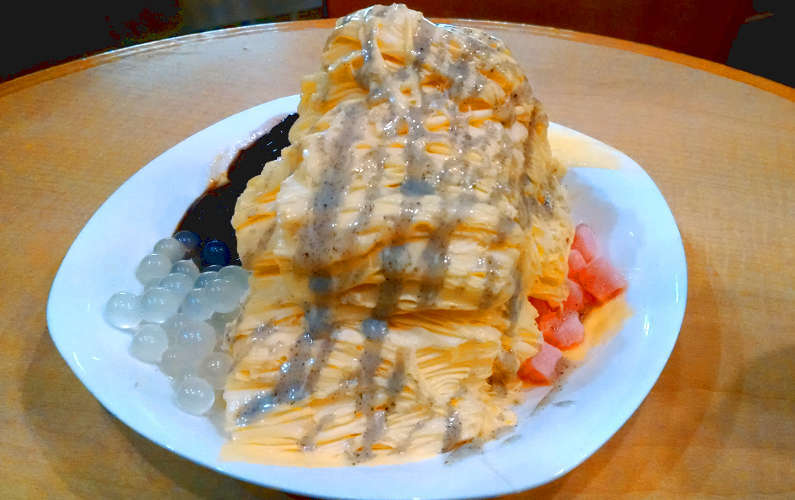 I bet you’re wondering to yourself, ‘JM, if that’s shaved ice, then what’s shaved snow?’ Well, I’m glad you asked yourself that question because shaved snow is an entirely different animal altogether. Is it shaved ice? No. Is it ice cream? No. Then again yes and yes. It’s kind of like both yet neither. You know what it is? It’s the best of both worlds in a perfectly sized portion… which is any portion, but take it from me and go one size up. You can never get enough of really good shaved snow. And let me tell you friend, all they are served here is great shaved snow. To top it all off, instead of a regular plain Jane block of ice, fruits were infused into the ice which helps give it that extra explosion of awesomeness. Before, I was much like yourself unaware of the soft creamy texture that one generally doesn’t associate with shaved ice. And I had tried other places which I once thought were great. But I had heard a lot about this place called Sno-zen and had been anticipating their wonderfully shaved snow melting on my palate as I wished for warmer days. As luck would have it, my better half, Nadia and I were both in the neighborhood and it was a rather warm day so going to Sno-Zen would have completed a perfect trifecta. Unfortunately parking was kind of a pain here especially since it’s a residential neighborhood and made all the more painful when particular person parked poorly irritatingly taking up more space than they needed to forcing us to park further away. To add insult to injury, we were further stupefied by the excruciatingly slow group of people at the front of the relatively long line (at this point any line was too long). Last but not least, I was surprised by the ticketing system utilized behind the counter consisting of some kind of archaic dual intake method for taking one’s order; essentially taking up more of my time that could have been best spent savoring the frozen delight to be. All issues aside, the slow down did afford us time to create our ideal shaved snow concoction. Fortunately, or unfortunately there were a few ingredients show cased in specials and pictures that seemed to be permanently unavailable so that slimmed down our choices. On the other hand there were more lists of extra flavors, toppings, and drizzles than I was initially led to believe. Surprisingly we still didn’t have enough time to figure things out by the time we got the cash register. A quick taste test between strawberry and regular mochi was all that stood between us and Sno-Nirvana (you heard/read that hear first). AMAZING! Mind blown… I will never be the same again. First off, we should have ordered the largest size they offered, and then paid more for them to make it even bigger. Their mango snow was so light, so delicious, so creamy… I thought it was ice cream and certainly not merely shaved ice. Second, the toppings were great. 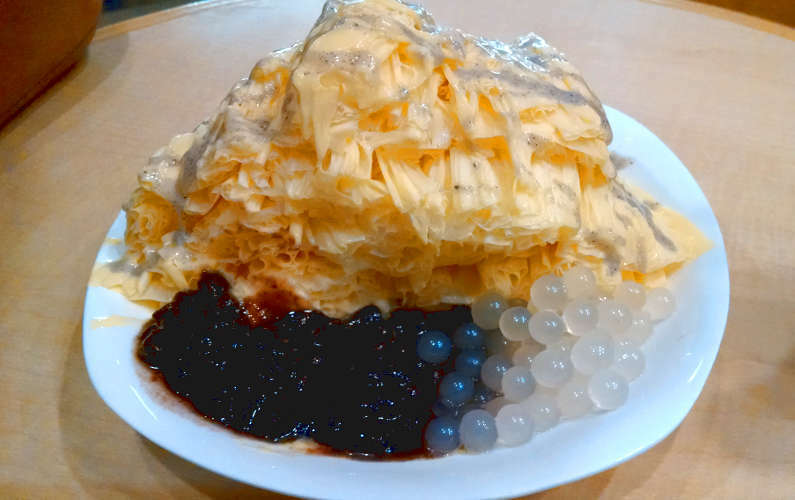 Usually at places that offer many choices, its sometimes hard to get the right combination but with the staff’s expert advice we were able to get the art of shaved snow creation down to a science. Third, the bursting lychee boba. What sorcery made these heavenly bubbles of lychee greatness? I don’t know and I don’t care. Just take my money and give me more! At that moment, I just realized, I had been remiss. Please Mr. Store Proprietor, please forgive me for my previous ill will. I did not know all that I was to savor would make complaints of any possible inconvenience unbecoming. I am in your debt and shall further patronize your establishment. Okay, pleasantries aside, what I’m trying to say is that this place was amazing and has completely ruined me for all foreseeable future shaved snow adventures. I’m okay with that, because I’ll be back with a vengeance to experiment more with this new dessert; painful parking situation and all. Ever try something that changed your world perspective? Or do something that has given you a new outlook? Hey there, I’ve been back recently and more often than not and found your improvements to be great. I’m saddened that the San Jose location was closed but am still happy to go to the original location to try all the new flavors.